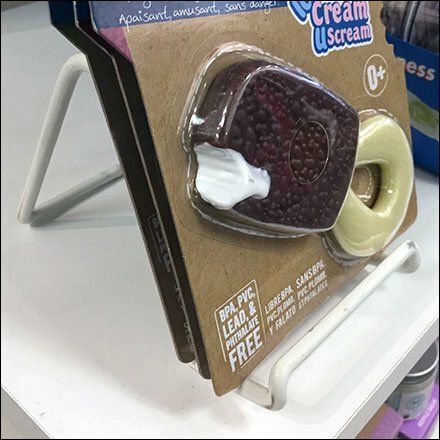 Carded for possible hook merchandising, this Baby Teether Shelf-Top Plate Stand Display provides an alternative strategy. It was a one-up display, so possibly its merchandise mates had all been sold. One must admit the tasty look of the AppeTeethers line. This Baby Teether Shelf-Top Plate Stand Display seen at Motherhood Maternity, The Shoppes at Montage Ski Area, Pennsylvania.